Enjoy these amazing Portuguese baked eggs with ham and chouriço sausage (ovos à espanhola) for brunch, lunch or dinner. Heat a little olive oil in a large, deep skillet and saute the potatoes until they are golden brown, remove with a slotted spoon and set aside. Add to the skillet the pepper, onion, 2 slices of ham cut into small pieces, half of the chouriço cut into pieces and cook until the onion is brown. Add some chopped asparagus, leaving 4 longer pieces for later use, add the peas, green beans, tomatoes and tomato paste. Season with salt and pepper, add a little water and throw the potatoes back into the skillet. Cover and simmer for about 10 minutes, stirring occasionally. Grease a pirex dish with butter and transfer all the vegetables with the broth to it. 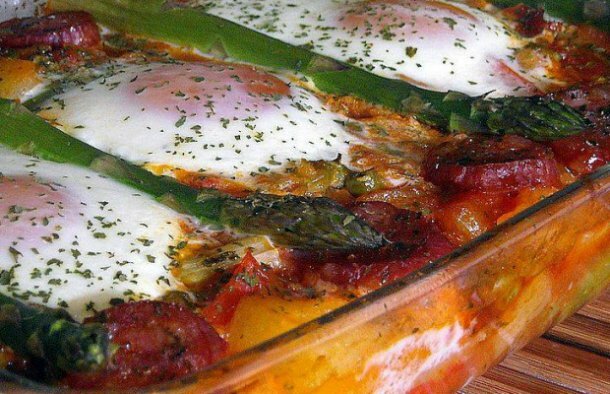 Crack the eggs over the vegetables, place the 4 pieces of asparagus over them, the rest of the ham cut in pieces and the rest of the chouriço. Sprinkle with chopped parsley (fresh or dried) and bake for about 20 minutes or until the eggs are cooked. 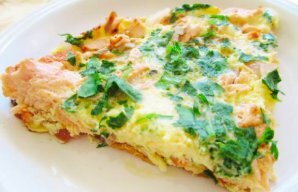 This Portuguese salmon omelette recipe is simple to make, delicious and healthy, enjoy! Portuguese scrambled eggs is an easy and inexpensive meal that is also flavorful. 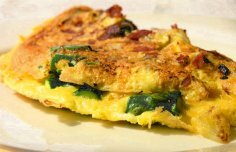 This is a delicious Portuguese recipe for an asparagus and chouriço Omelette.